Last night was the Harvest Moon! That means it's time for moon-viewing festivals and the Chinese Mid-Autumn Festival! The Japanese version of the Mid-Autumn Festival is called Tsukimi (月見), or the honorific Otsukimi, which literally means "moon-viewing." It's definitely toned down compared to the Chinese festival, but both are celebrated around the same day: the 15th day of the 8th month according to the lunar calendar, also known as the full moon that occurs closest to the equinox. Traditionally it is celebrated with seasonal autumn food such as chestnuts, green soybeans, taro, and sweet potatoes. Another important tsukimi food is tsukimi dango (sweet rice balls), which are often placed on an altar along with sprigs of susuki (pampas grass) and sake as an offering to the moon to pray for an abundant harvest. The Tsukimi Burger looks pretty good! While the full moon has come and gone, there's still plenty of moon out for you to party under! My one Japanese professor at UCLA told the class really, the whole week is an excuse to drink sake outdoors under the moon. You can make your own moon-viewing treats at home, just by putting an egg on it. Tsukimi udon and soba are two traditional bowls of noodles that feature an egg that gets poached in the hot broth. The yellow egg yolk is supposed to resemble the moon, hence the name. 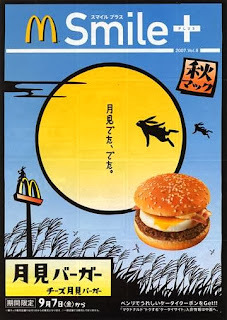 McDonalds in Japan even gets into the spirit of the occasion and has their tsukimi burgers, which feature a fried egg. Here's a quick and easy recipe for your own moon viewing party. You can definitely use soba or udon instead, I just chose ramen because it is by far the easiest Japanese noodle to find here in America. Plus I love ramen. You could really just take your favorite instant ramen and put a raw egg on top to poach in the hot broth, but this broth is a little more traditional. Either way, it will be tsukimi ramen! The mixture above of soy sauce, mirin, and sugar is called kaeshi, which we will dilute with dashi to make the soup base. These quantities can be doubled or tripled and the kaeshi can be placed in the fridge, where it can be stored for months. Take the kaeshi and dilute with dashi to make the soup broth. Heat to simmering over medium heat. Meanwhile, prepare the noodles by immersing in boiling water for three minutes. Drain and place into two ramen bowls for two servings. Pour the soup base over the noodles and sprinkle with the green onions and add a dash of sesame oil on top. Crack one egg in each bowl being careful not to break the yolk and serve immediately. You can also use just the yolks if you want and save the egg whites for another purpose. Note: Yes, that eggshell is bluish-green. It's totally lifted from my parent's house, whose chickens produce so many eggs it's not really stealing if your mom is always asking if you need another carton. I'm saving up for a possible trip to Japan (!!!) so free eggs are definitely on the menu. The type of chicken that lays funny colored eggs are called Araucana or Ameraucana/Americauna. I should have taken a clearer picture in natural light to show off the eggshell, but I didn't think of how funky it would seem to a person who didn't grow up with crazy heirloom chickens.